The UN in Syria and Syrian Arab Red Crescent mount the largest aid convoy of the whole conflict, to deliver humanitarian assistance to 40,000 people in Rukban. The largest UN humanitarian convoy of the Syrian civil war reached the remote settlement of Rukban, on the border with Jordan on Wednesday, where it is delivering life-saving assistance to more than 40,000 displaced people, some of whom have been trapped there for years as the eight-year conflict grinds on. The vulnerable inhabitants, the vast majority of whom are women and children, are living in desperate conditions that have worsened due to the harsh winter: at least eight young children have reportedly died in Rukban in recent weeks. The convoy of 133 trucks –a joint operation with the Syrian Arab Red Crescent - is delivering food, health and nutritional supplies, as well as hygiene materials, education items and children’s recreational kits. In addition, vaccines for 10,000 children under the age of five have been sent with the convoy. The humanitarian supplies provided during this convoy were chosen based on the findings of a needs assessment carried out during the previous convoy to reach the outpost, in November 2018. Monitoring will also take place during the current convoy by the UN and Red Crescent teams to ensure that humanitarian assistance reaches civilians in need. In order to bring about a situation where the displaced people at the settlement can return home, or to a place of their choosing, the UN and Red Crescent will carry out a survey to consult with them on their wishes and priorities. In the Wednesday statement, the UN underlined the fact that it urges all parties to allow safe, sustained and unimpeded humanitarian access to all people in need in Syria line with their obligations under International Humanitarian Law. 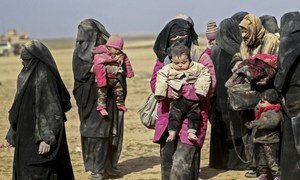 In the last three years, tens of thousands have fled to Rukban from ISIL or Da’esh extremist- held parts of Syria being targeted by Russian and U.S.-led coalition air strikes, according to news reports. The camp lies inside a “deconfliction zone” set up by US-backed coalition, Russian and Syrian Government forces, which has reportedly encouraged many of Rukban’s inhabitants to stay rather than go back to their homes in areas under Government control where they fear retribution by the Syrian army. 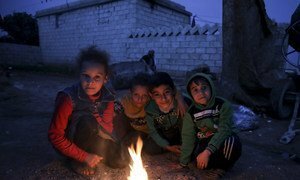 With people in Syria “suffering a cold, hard winter”, the United Nations Emergency Relief Coordinator on Wednesday appealed for international funding, backed by UN Security Council support for safe aid delivery, to alleviate the conditions faced by millions struggling for survival amidst rain, snowfall and freezing temperatures across the still war-torn nation.